Welcome to another thrilling episode of June Forge World Unboxings! Last time we looked at the new, and VERY large Hakflem Skuuttlespike. 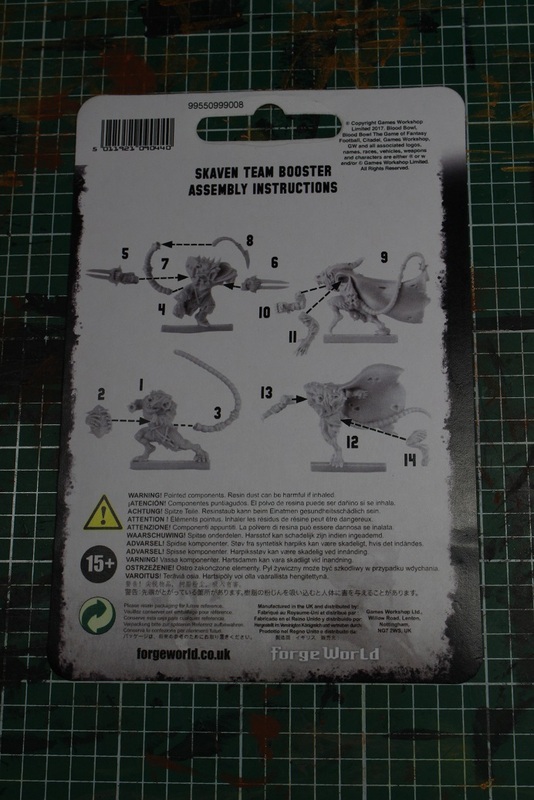 Today we will keep with the Skaven theme and look at the first of the team booster packs from Forge World. 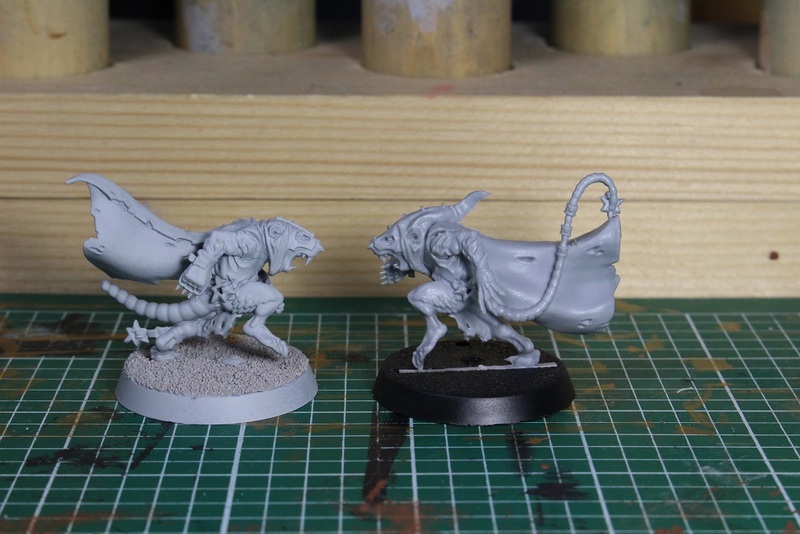 Now, I have heard a lot of people say that they already have two Throwers and two Storm Vermin Blitzers from the boxed set, why would they need more? 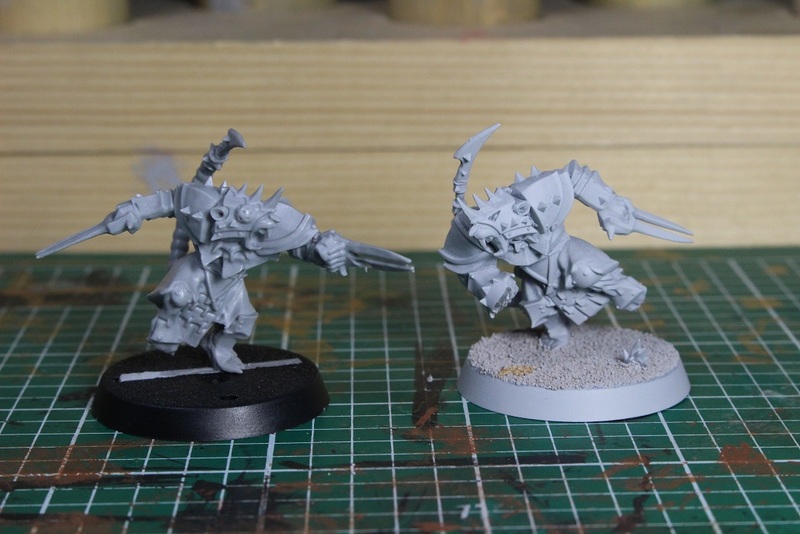 Well realistically, you do not NEED more Throwers or Blitzers, but I simply choose to be happy about getting more variety in the sculpts. Whether I already have enough minis of that position to fill out the roster does not matter so much to me. Yes, it would be nicer if there were more unique options out of the team box. Yes, it would be nicer if the booster pack was plastic and not resin. 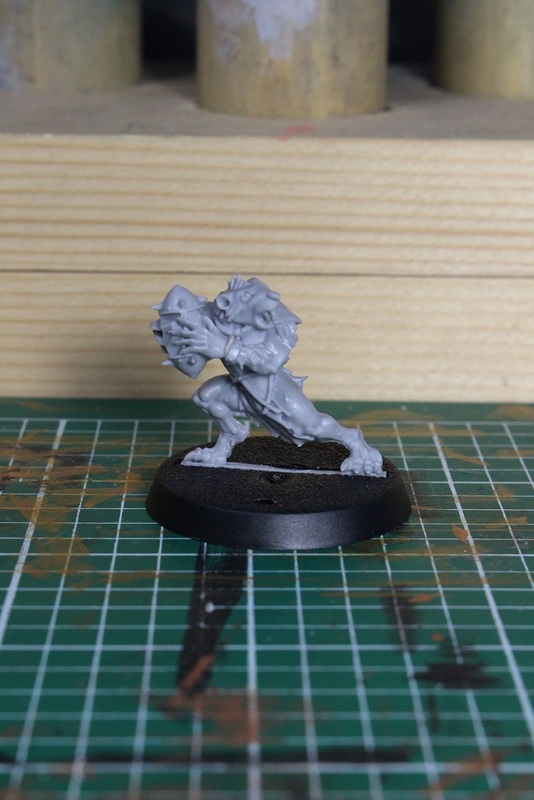 Again, I choose to be happy about having more Blood Bowl minis to buy and not get bent out of shape over things that I wish were a little different. But that is just me. 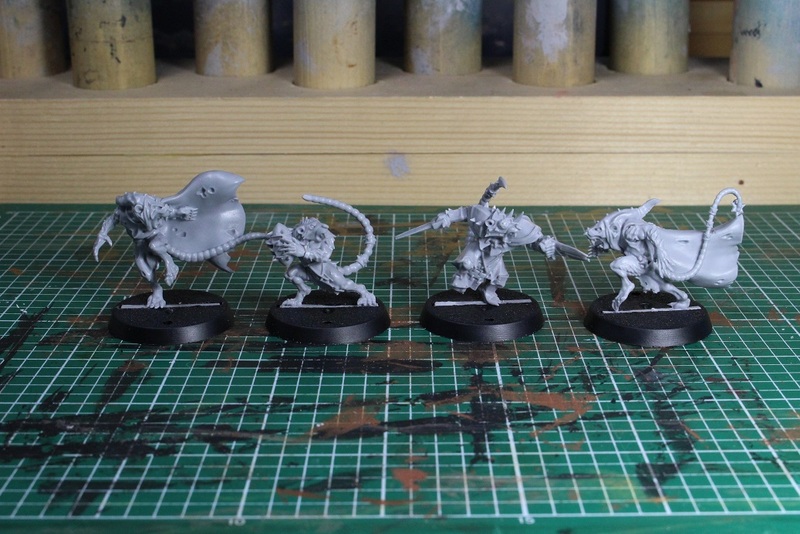 Anyway, enough of my gaming philosophy nonsense, time to check out some new minis! 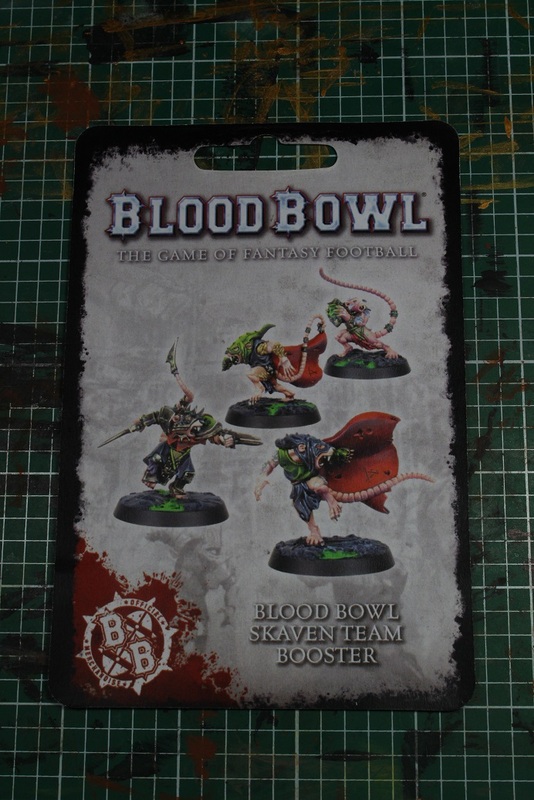 As you can see… and you probably already knew, the booster pack includes four minis. 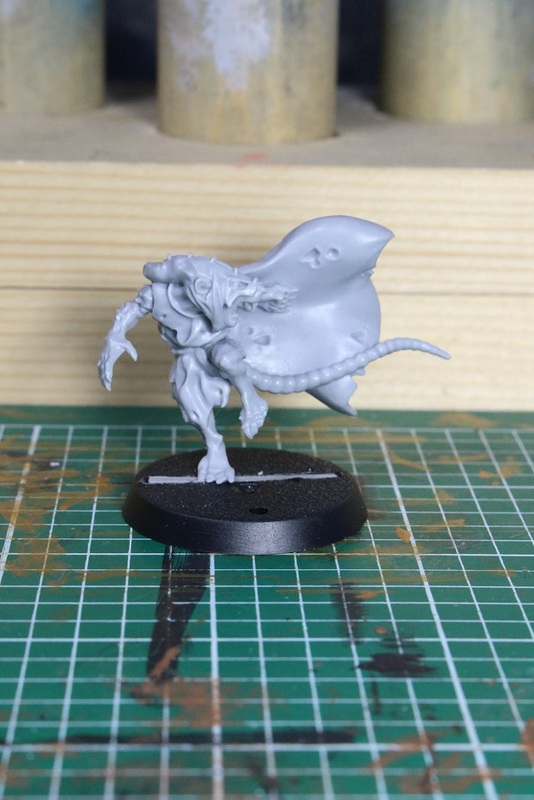 One Thrower, one Storm Vermin (are they still called Storm Vermin?) 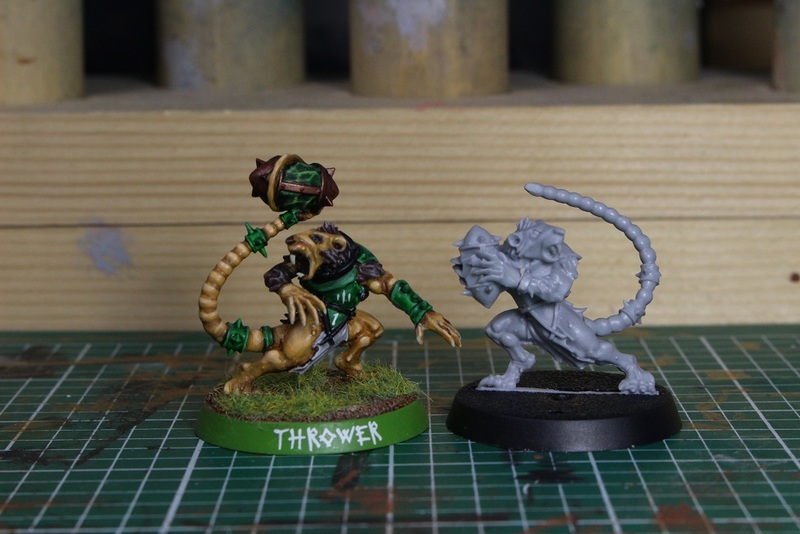 Blitzer, and two Gutter Runners. 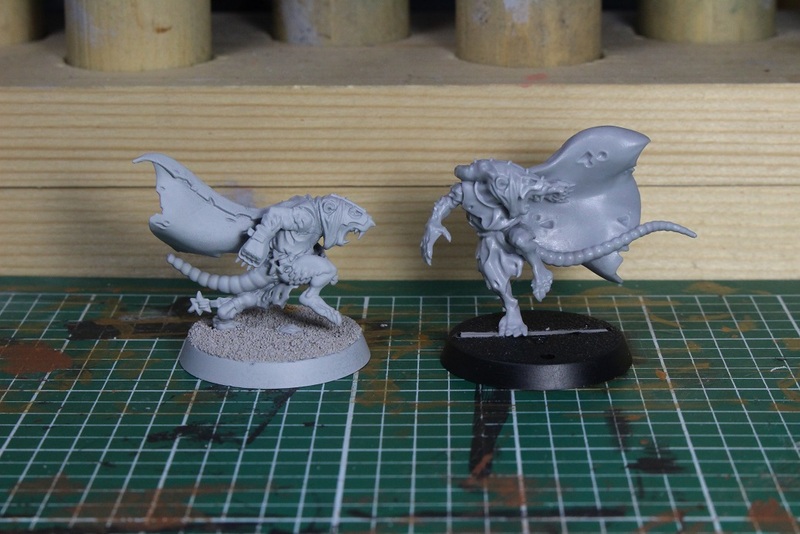 That gives us a total of two unique sculpts for both the Thrower and Blitzer (you can only have two of each on your roster), and three unique sculpts for your four possible Gutter Runners. 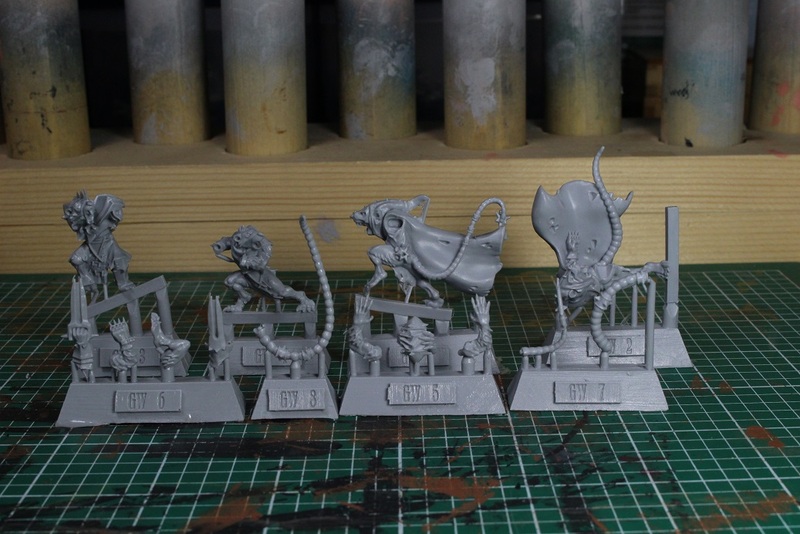 As always, the insert gives us nice pictures of all the minis painted up very nicely. The insert is only a single page, printed front and back. Since these are just regular players, and not Stars, there is no need to waste space on printing fluff for them. 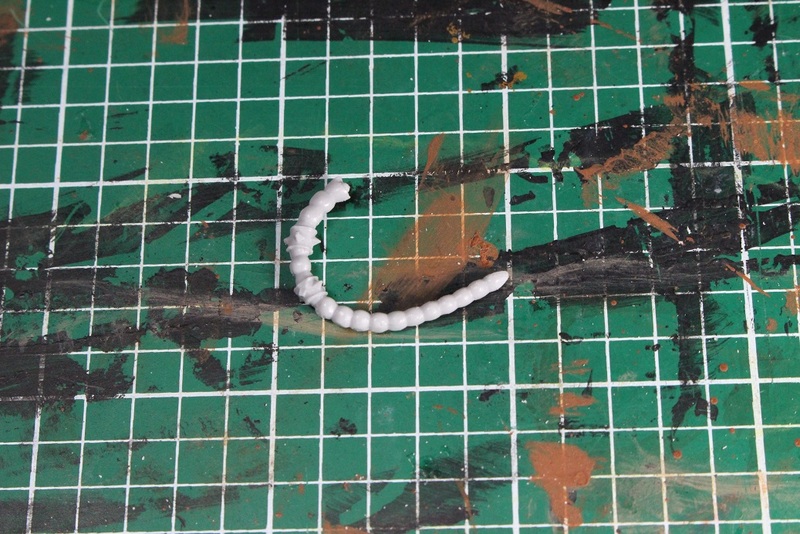 As you can see, each minis consists of only a few pieces, which I was really glad for. The Blitzer had the most pieces, coming in at five. 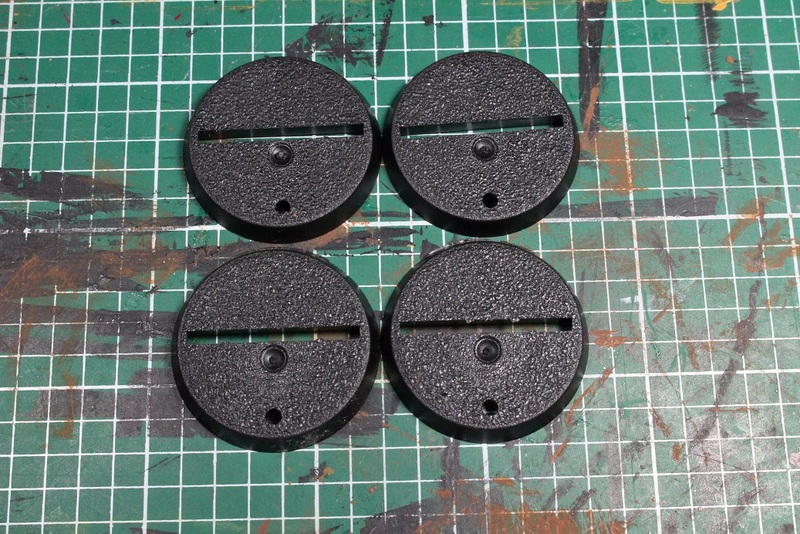 Also in the package are four slotted bases only. No non-slotted bases. Why did we only get slotted bases? Well, that is because the minis in the booster pack actually come with base tabs. 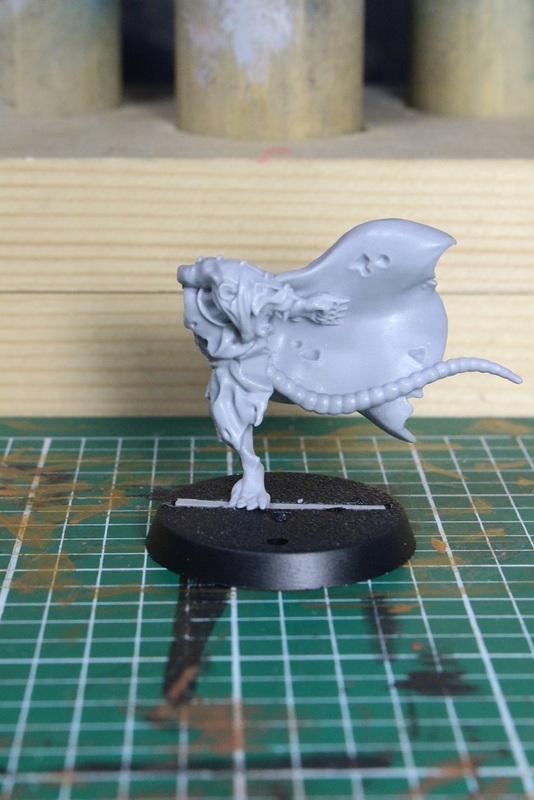 That fact begs a legitimate question… why do the Star Players NOT come with base tabs?! I had to pin Hakflem’s foot to his base to get him to stand up for eff’s sake! I digress………. Here are all the pieces lined up and ready for their soapy bath, then assembly. I decided to start with the Blitzer. 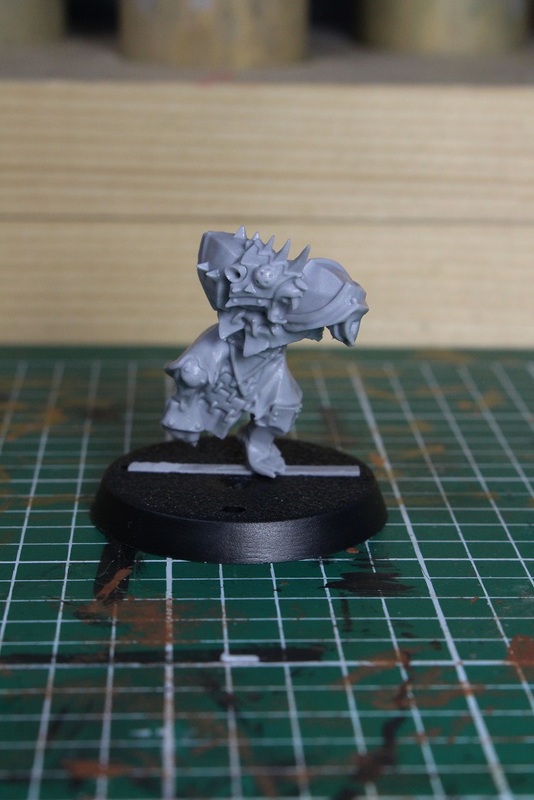 Looks, he is already on a base… how convenient that he comes with a base tab! Sorry… Anyway, stylistically he fits in very well with the boxed set team. 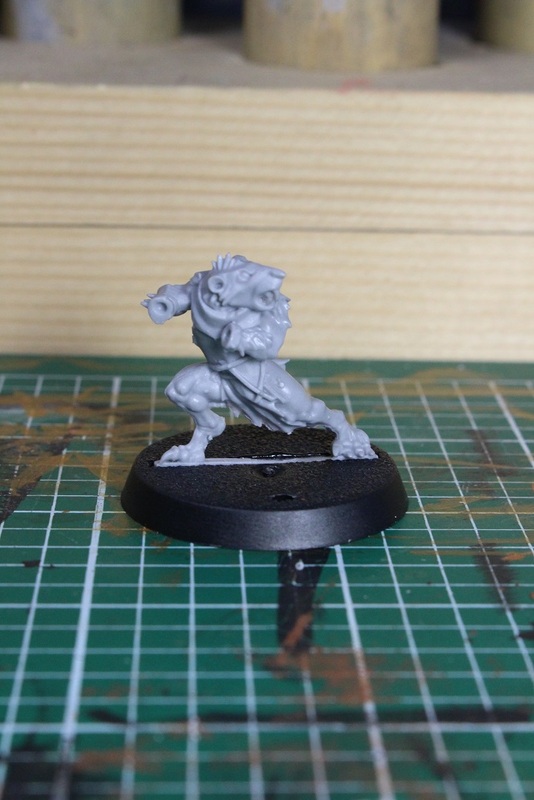 Unlike the Rat Ogre and Hakflem, he looks like he was designed by the same sculptor that designed the full team. This arm had the only real casting issue with the booster pack. You can see on the right on the underside of the punch dagger that there is a big chunk missing from the blade where the cast had issues. 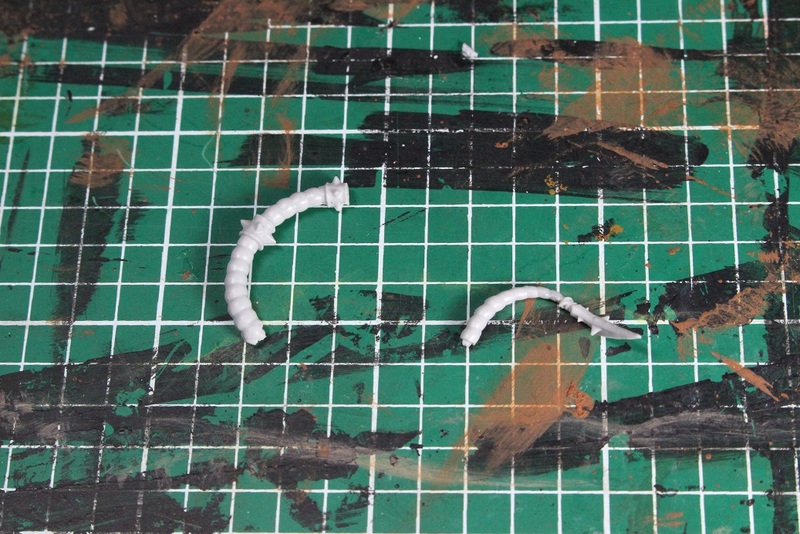 The miscast can most likely be easily fixed with a little bit of green stuff. 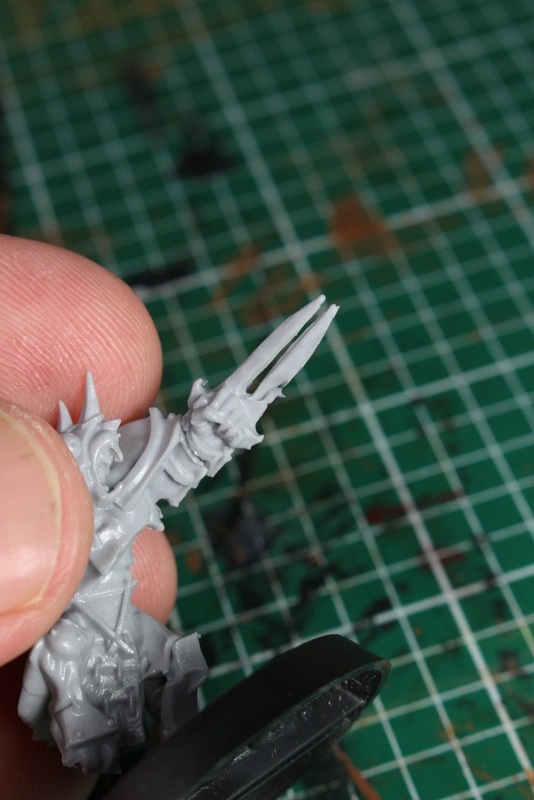 Having said that, this will probably end up being the punch dagger that gets trimmed off as I do not really think he needs three foot long blades on both hands. I think this is the only thing that i do not like about these minis. 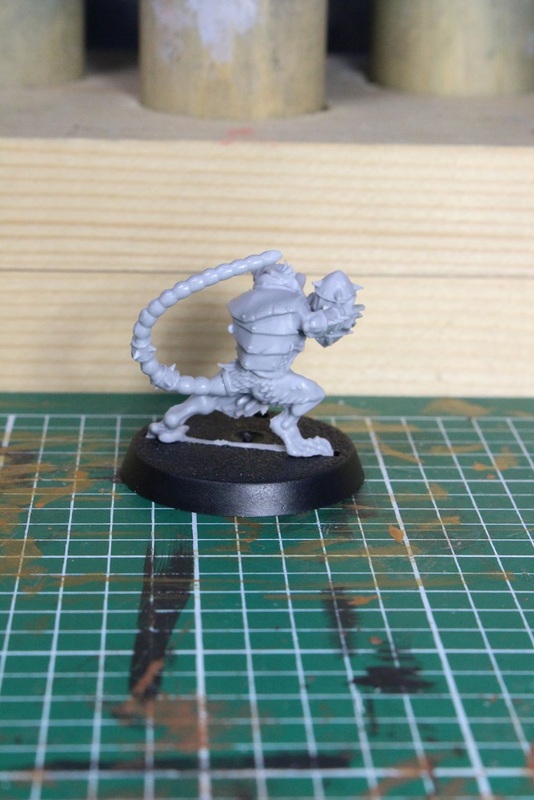 Like the boxed set minis, a couple of them have some REALLY silly long tails that get very flimsy towards the end. 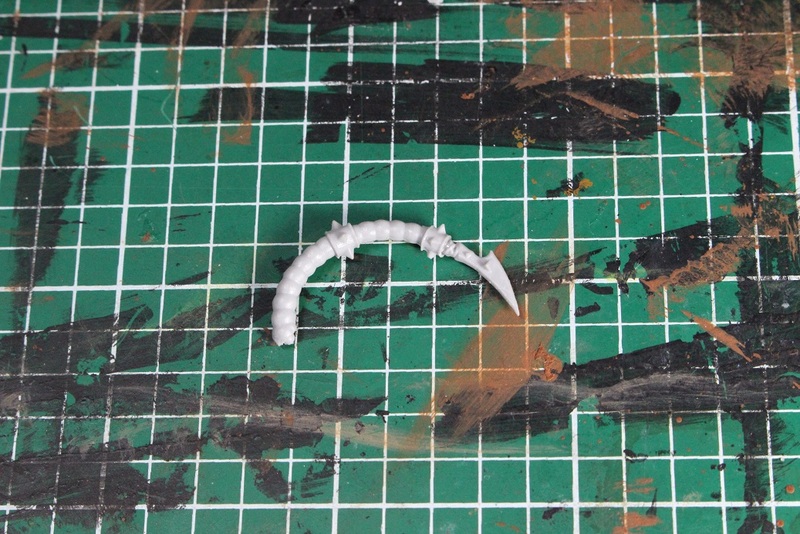 Also like the boxed set minis, I decided to trim a couple of the tails. The Blitzer’s tail was pretty easy. All I needed to do was snip the excess and insert the blade directly into the hole already in the end of the thicker piece of the tail. I DID drill out the hole slightly, but it was probably not completely necessary. Here is the newly shortened tail assembled. With this, the Blitzer is now done. Here he is next to the original Blitzer from the boxed set. Scale is basically identical, and the style match is pretty right on. Of course, you would expect that to be the case since the new minis are supposed to be a booster pack for the already released team. It is simply nice to see reality live up to expectations. Next up is the Thrower. 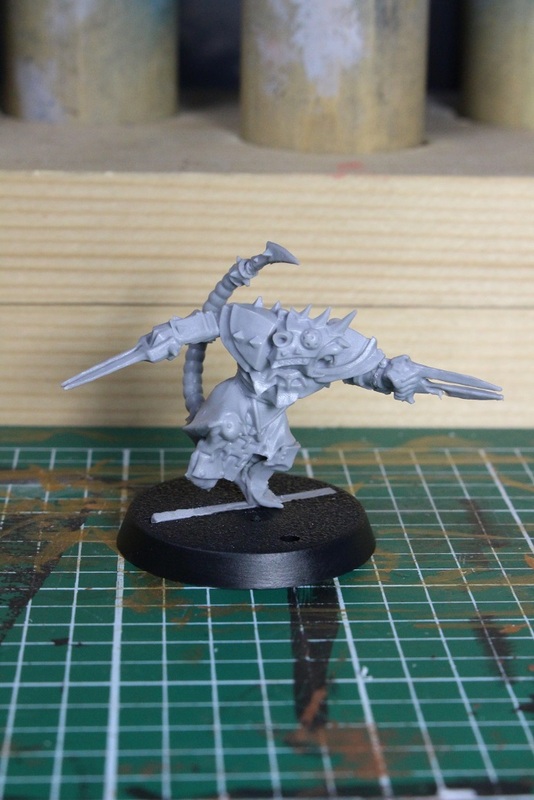 At only three pieces, he is a very simple mini to assemble. Both hands are attached to the ball and go onto the mini as one piece. 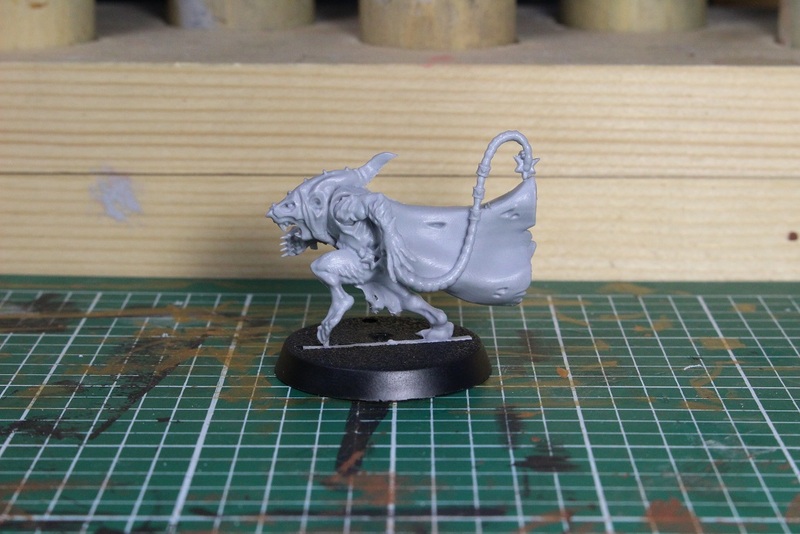 I am also happy to report that this minis is NOT throwing the ball with his tail. This is another tail that I decided to shorten out of fragility concerns. It is hard to tell from this picture, but the tail is actually a bit longer than it appears as the end curls up towards the camera here. I trimmed about a third of the length off and filed the end down to a hopefully natural looking tip. 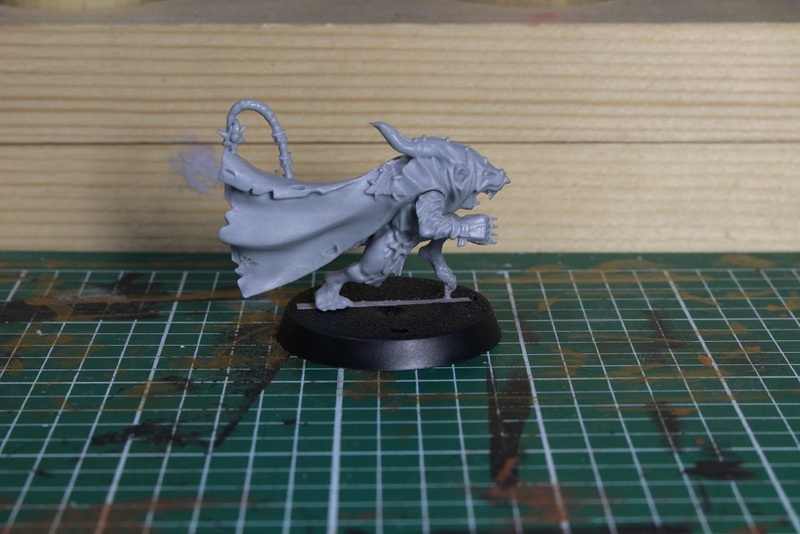 Now we have the first of the two Gutter Runners. 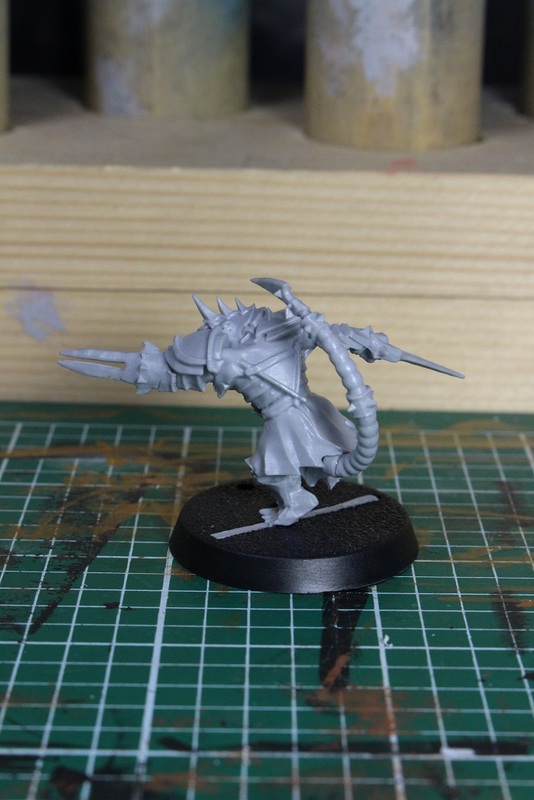 This mini ended up with the longest tail of all the Skaven on my team due to the fact that his tail is mostly molded into his body and cape, so there was really no practical way to trim it. Since it is anchored on both ends, I hope it will be strong enough to hold up to years of play. Here we have the first arm attached. Both arms attached… Like the Thrower, this mini is also only three pieces, so it is very easy to assemble. Here he is staring down the Gutter Runner from the boxed set. I think he is just showing off because he has a much longer tail than his teammate! 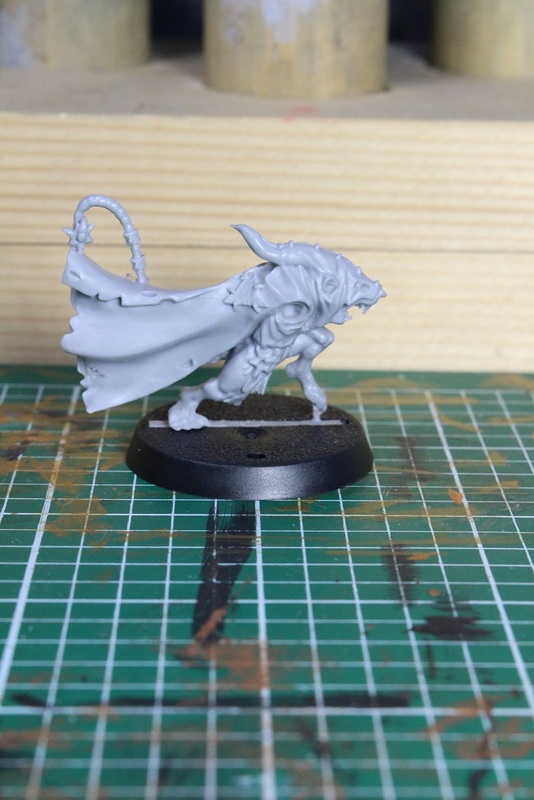 Finally, we have the second Gutter Runner. 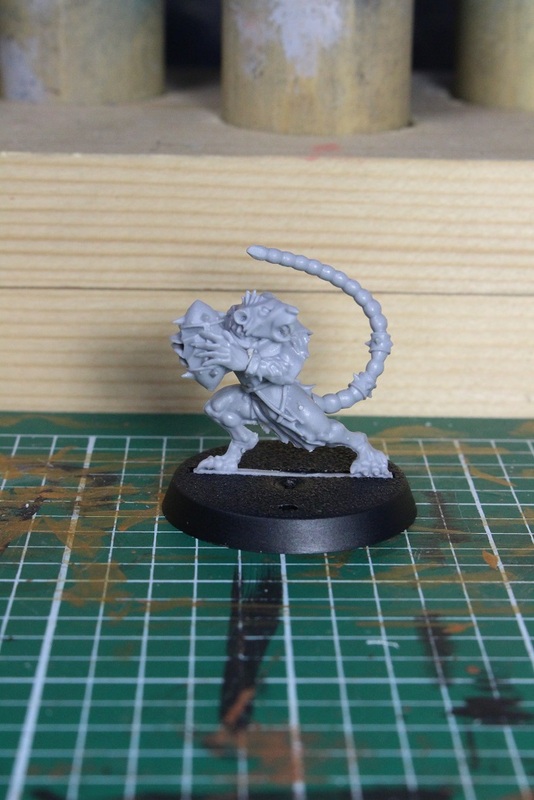 As you can see, he is the only mini in this booster pack with a tail of reasonable length. Apparently I forgot to take a picture in between attaching the leg, and attaching the arm. 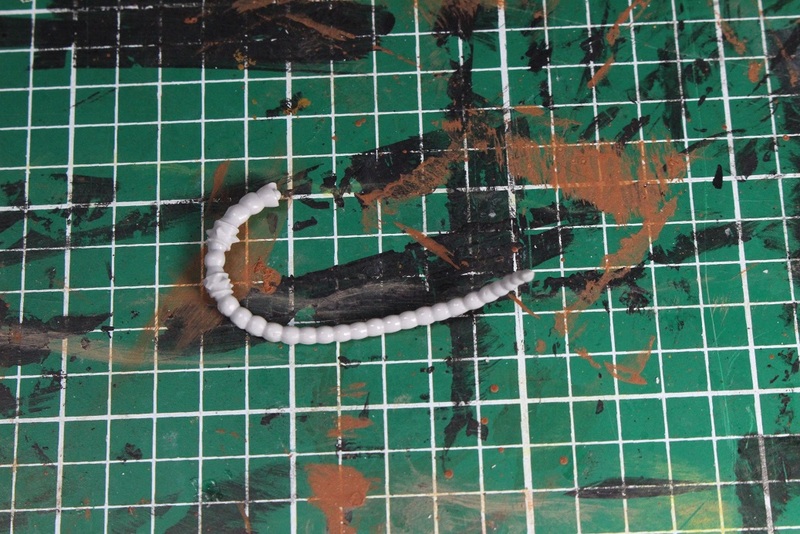 Sorry about that… Anyway, he is also only three pieces, so assembly was a breeze. 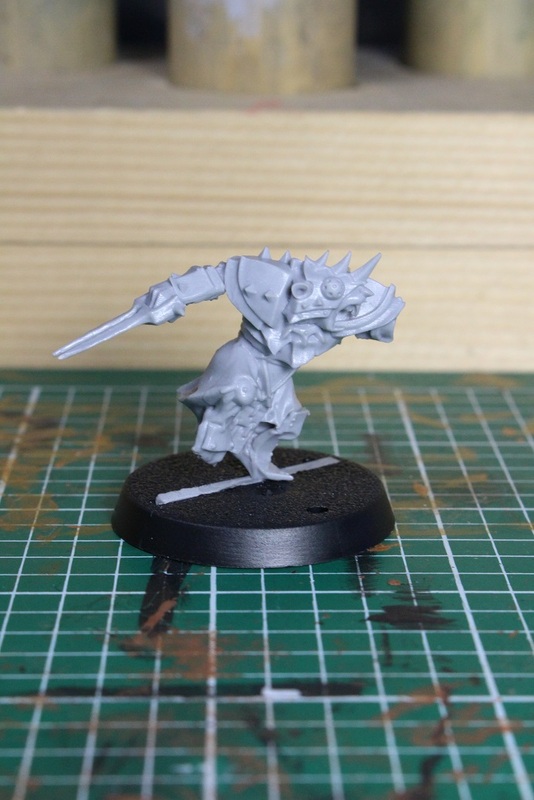 He looks a little taller than the boxed set Gutter Runner, but that is just his pose being up on one foot. And here we have all four players of the new booster pack. 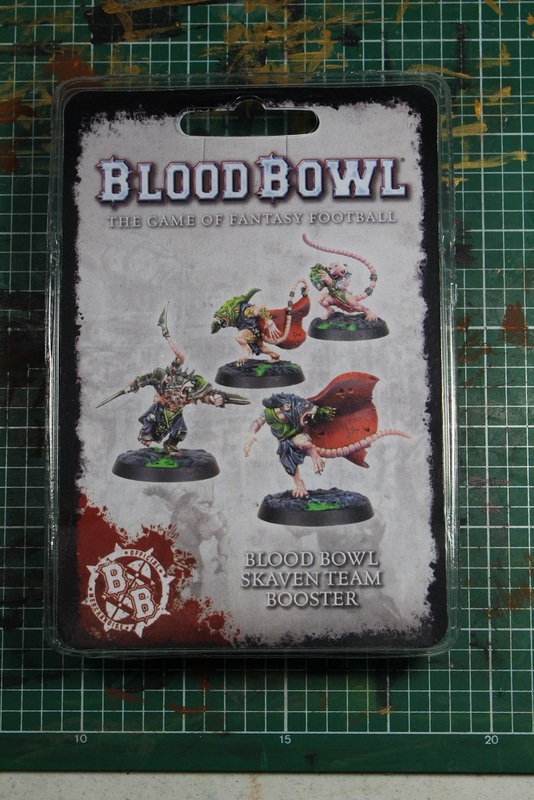 All in all, I really like these minis and I feel like they add some much needed diversity to the Skaven boxed set team. 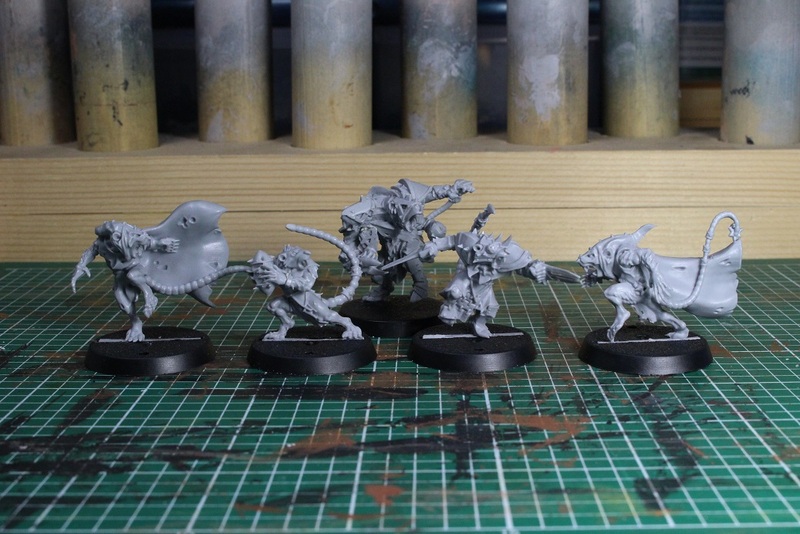 I DO wish they were plastic and not resin for cost reasons, but beggars cannot be choosers, and I will not complain about getting new minis. I think they are a good addition to my team and worth picking up. 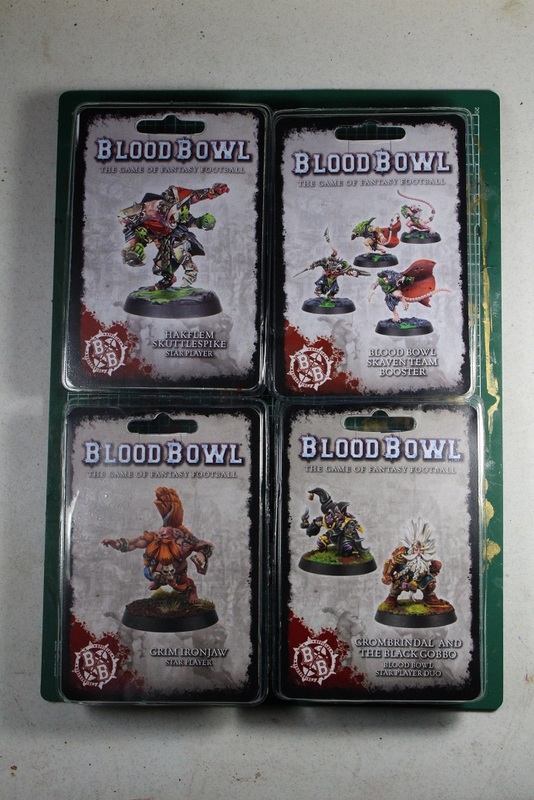 Just for giggles… here is another pick of the booster pack minis along with Hakflem. 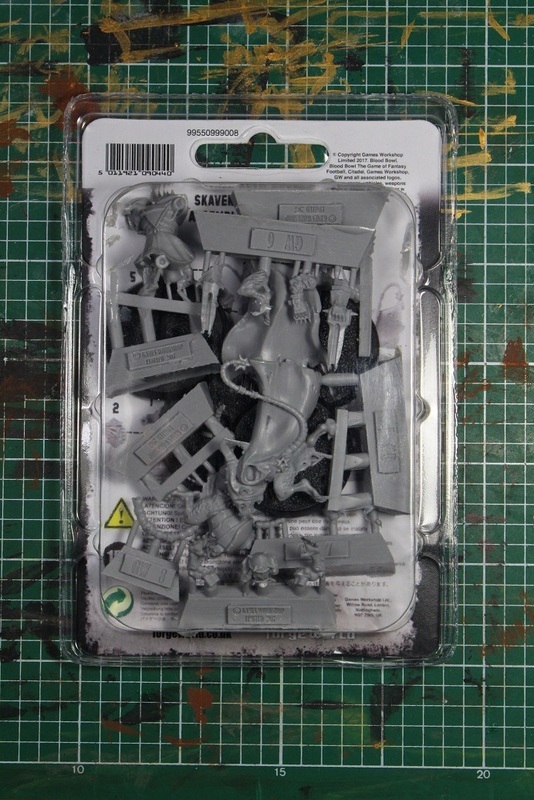 I still have Grim Ironjaw and White Dwarf/Black Gobbo packs to go. Which unboxing would you like to see first? Let me know in the comments! 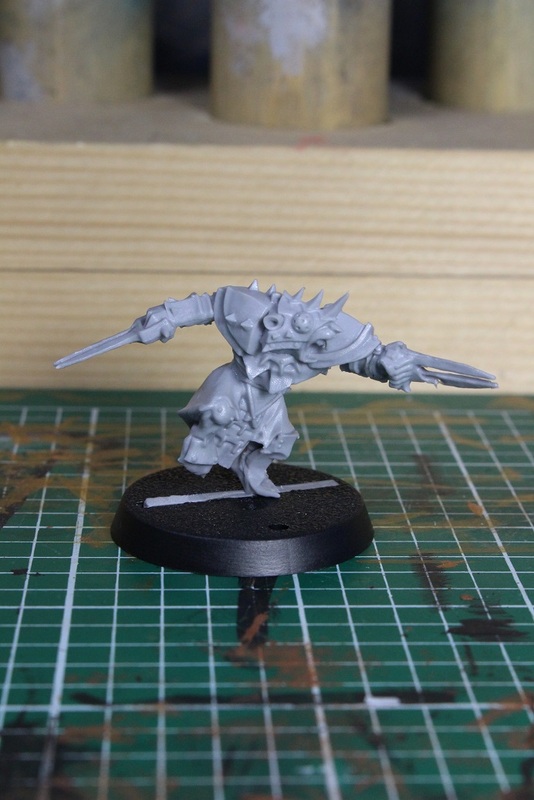 This entry was posted in Blood Bowl, Gaming, News and Rumors and tagged Blood Bowl, Forge World, Forgeworld, Games Workshop, gaming, Miniatures, Skaven, Skaven booster, Skaven team, table-top games, tabletop wargames, wargames, Wargaming by Mike C. Bookmark the permalink. Grim first, save the best till last! Nice write-up. I feel like you may not be the only one trimming tails from this box! Grim is winning the Facebook vote as well. Looks like he will be the likely winner. I’ve been trimming some of the tails, but I stole the idea from Mikey when he mentioned it at TFF. I also think I switched the tails with the ball ends onto both blitzers, to unify appearance. I remember when I was first learning BB, and trying to learn what all the models were, it was helpful when I could find something like the “pony tails” on the human blitzers to easily identify them. I even painted those tails in a color to make them stand out. It helped quite a few new coaches. Shortened tails does make them a little more manageable. I haven’t actually field tested them, as I’m still trying to find a way to fit painting into my schedule. Then someday get back to playing the game! I’ll say Grim as well. I’m happy with the Willy one I just picked up, as it did save me quite a bit of money, but I’m also curious how the FW one turns out.